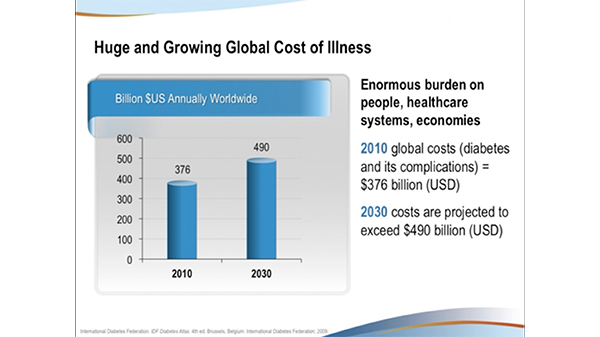 The total economic burden of diabetes worldwide is huge and growing. 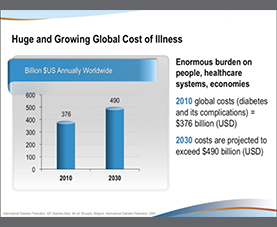 This economic burden on people, healthcare systems, and economies was estimated at a global cost of at least 548 billion USD (US Dollars) in 2013, and is projected to exceed 627 billion USD in 2035*.1 Diabetes affects at least 382 million people worldwide, and that number is expected to reach more than 592 million by the year 2035*.1 This International Summit, convened in Dubai, United Arab Emirates, with world experts in diabetes management, identified therapeutic strategies to reduce the prevalence and impact of prediabetes and type 2 diabetes (T2D) on a global scale through the use of transcultural Diabetes Nutrition Algorithm (tDNA) activities. The tDNA simplifies complex clinical practice guidelines in an algorithm for the nutrition management of people with prediabetes and T2D, fostering multidisciplinary care management. The transcultural approach designed in the algorithm accommodates regional differences in nutrition, genetics, genomics, lifestyles, foods and cultures. Lifestyle management with an emphasis on Medical Nutrition Therapy (MNT) with Glycemia-Targeted Specialized Nutrition (GTSN) is an inexpensive, yet highly effective therapy to help reduce the economic burden of diabetes worldwide. We hope the enduring materials from this international summit provide you with the tools to improve patient outcomes in diabetes management in your healthcare practice. *Estimates have been updated following the International Summit to reflect the latest IDF Diabetes Atlas, 6th ed. 2013.